After being summoned like a Saudi diplomat to appear before the crown prince of Saudi Arabia, Saad Hariri returned to Beirut to pack and say his goodbyes, then returned to Riyad, picked up the phone and called the Lebanese president to tell him that he is quitting. The bizarre process led President Michel Aoun to wait to see if Hariri return and inform him in person, and through the proper protocol, about the reasons for quitting before accepting his resignation. That might be a very long wait. Clearly, the Hariri’s decision to resign is not his own. After all, all the reasons he mentioned are not new developments: Lebanon is under the circumstances and conditions as when he agreed to the deal that brought him and Aoun to the offices of the presidency and the prime ministry. 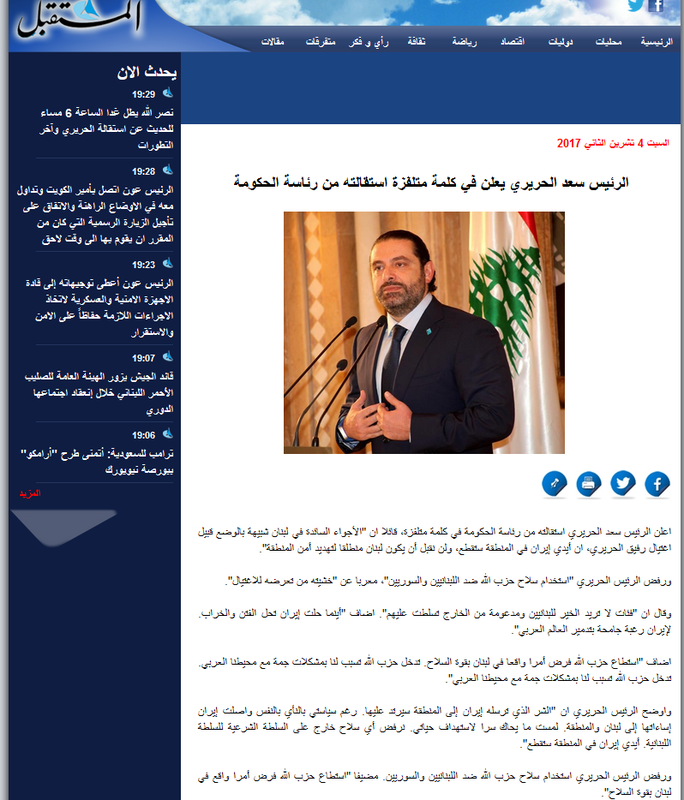 Among the reasons, real and fictitious, that forced him to resign, Hariri claims that he could be assassinated, that Iran in meddling in Lebanese affairs, and that Hezbollah is a destabilizing force because of its use of force against Syrians and Lebanese citizens. Before he agreed to the deal that made him prime minister, Hezbollah was doing whatever it is doing now, Iran was doing whatever it is doing now, and his fear for his life then was as much a risk then as it is now. Clearly there is something else that has changed: Saudi Arabia’s plan for the region. The summon is proof of that fact and it is also proof that Saudi Arabia is meddling in Lebanese affairs. Those who know Lebanese politics, know that many regional and world powers meddle in Lebanese affairs, so there is nothing new here. These developments are indicative of Saudi plans to escalate its efforts to further destabilize Lebanon, and country, whose stability is crucial to region given its geography, demography, and history.